Playing dress up is NOT for us! Love going for car rides! 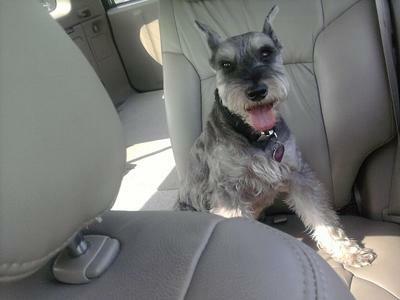 My name is Sir Bishop and I am a highly distinguished 11 years old male Miniature Schnauzer with cropped ears. I am very wise and noble. I am extremely social but do so enjoy my time sitting in front of the large picture window watching the world go by. Sun bathing in the backyard is another one of my favorite hobbies. I was raised with kittens and children so I consider myself to be a well-rounded individual. Notice I did not say dog! Hello, my name is Buster Brown and I am a 6 year old male Miniature Schnauzer with floppy ears. I am very playful and always happy. We just moved into a new house and there are something called “chipmunks” here. I have never seen such a thing. However I have been spending my days walking around the backyard picking up their trail in hopes they will want to play with me. I am super loving and always want to be in the same room as everyone else. We are very playful and love to curl up at night with our Mommy. We love to ride in the car too and smell all around at the exciting rest stops. 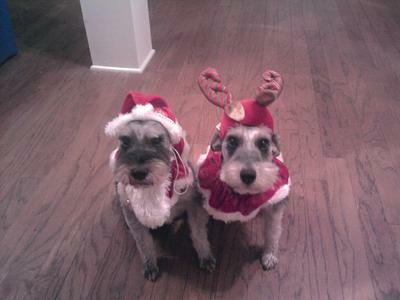 One thing we are not pleased about is playing dress up with her, especially at Christmas. As well let’s not sit too close together for picture time. However we don’t mind sitting in Santa’s lap every year but that’s probably because everyone is squeaking those wonderful toys at us. Mom says we are just like kids, always wanting attention and love to be around family and friends. We are very pleased to meet you and hope that you will comment on our pictures that Mommy provided. Comments for Playing dress up is NOT for us! Love the attitude they are displaying while in their Christmas photo! You can tell they are not happy, yet they sat pretty and posed for the picture. They have the funniest expressions on their sweet faces! Mr Bishop-you always look so much like a gentleman. Aunt Debbie loves you. Max sends his best paw. Buster can't believe you haven't got into the tunnels with the chipmunks yet, just remember they have very sharp teeth. Love you boys. I am a big fan. 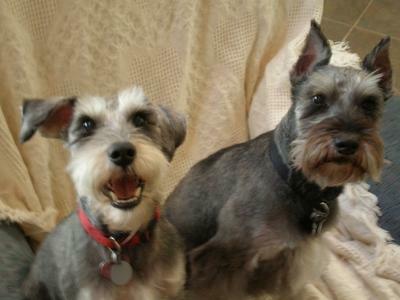 They are very handsome Schnauzers! They remind me of my Tripp & Bash that left us about 2 years ago! I miss them so! Tripp loved his polo shirt in the winter because he was very cold natured and Bash hated clothes! I now have a Toy S chnauzer (liver pepper) and a Teacup Schnauzer (liver party) named Mali and Demi Shae! They also love to play with their 1st cousin, Dixie Belle, who cannot wait to visit again at your new house. Best looking fellas on the site! Happy Boys, none the less. They look like a couple of cool dudes to me! You forgot to mention they love to fetch a tennis ball, and sleep in the same bed as their owner! !